Across the country, states desperate to prevent opioid addiction are increasingly looking to medical cannabis as a solution. Lawmakers in several states, including New York, Indiana, Georgia and Tennessee, have taken action to initiate or expand their medical marijuana programs to try and address the opioid crisis. Illinois is trying to do the same. On May 31, the last day of the spring session, state lawmakers passed legislation that could open access to medical marijuana for millions of patients. The Alternatives to Opioids Act would allow more patients to apply for temporary access to the state’s existing medical cannabis pilot program. To qualify, a person must be 21 or older and have a condition for which opioids might be prescribed. Patients would no longer be fingerprinted or need criminal background checks. Instead of waiting months for approval, patients could get near-immediate access to cannabis products at licensed dispensaries by presenting paperwork signed by their doctor. The bill streamlines the program and reduces the backlog of applications, said lead sponsor Sen. Don Harmon, a Democrat from Oak Park. “As we see the horrible damage inflicted by opioid use and misuse, it seems like a very low-cost and low-risk alternative,” Harmon said. Last week, New York Republican state Sen. George Amedore cited the opioid crisis when he spoke about legislation that would allow doctors to prescribe cannabis oil as an alternative to opioids for certain conditions, as WAMC reported. Illinois is one of 29 states plus Washington, D.C., with a law that allows patients access to medical marijuana. Under the current program, a doctor must certify a patient has one of 41 qualifying conditions, which include HIV/AIDS, cancer, terminal illness and post-traumatic stress disorder. Chronic pain does not qualify a patient, although earlier this year, a judge ordered Illinois to expand the program to include intractable pain that can’t be effectively treated with other therapies. That move is on hold as the state’s Department of Public Health appeals that ruling. The new measure could increase the number of people in Illinois who can access marijuana for a medical condition. The medical cannabis program currently has about 38,000 licensed users. 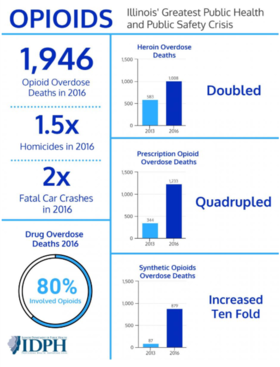 The number of prescription opioids filled in 2017 topped 5 million. Harmon said he hopes the measure will reduce the number of prescription opioids to new patients and help others taper off opioids. Now it will be up to the governor whether this legislation, which received wide bipartisan support from the House and Senate, becomes law. Advocates for medical marijuana see the measure as a necessary step to combat the state’s opioid crisis. In 2017, more than 13,000 people in Illinois overdosed on opioids. About 2,000 of those were fatal. “I think it will save a lot of people’s lives to be quite honest,” said Dan Linn, executive director of the Illinois chapter of National Organization for the Reform of Marijuana Laws, which advocates for the legalization of marijuana. The measure will be “both a lifeline to those patients who are being prescribed opioid-based painkillers, as well as the medical cannabis industry in Illinois,” Linn said. 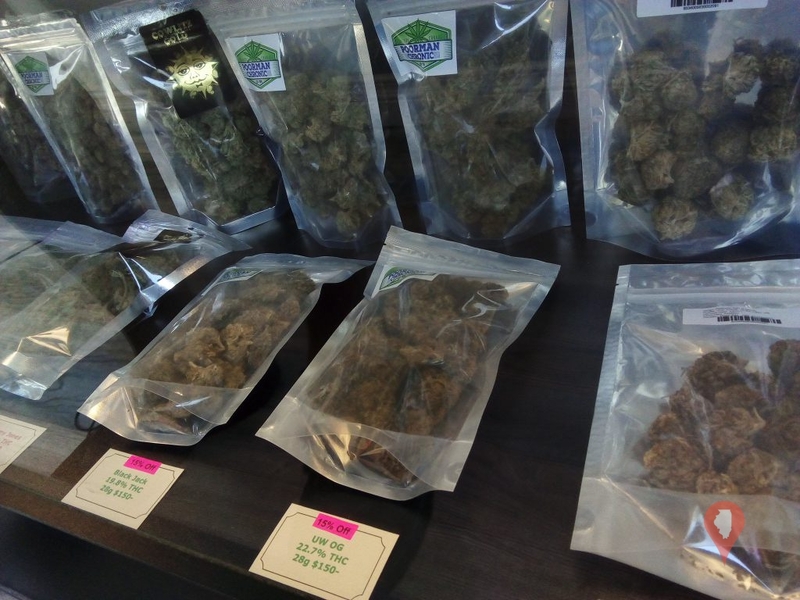 The state’s 54 licensed cannabis dispensaries crafted their business models with the expectation they would have 100,000 qualifying patients in the program by now, he said. Linn anticipates the bill could almost double the patient count to 75,000 within a year of implementation. Some who work on the frontlines of addiction treatment are concerned the policy is getting ahead of the science. Aaron Weiner directs addiction services at Linden Oaks Behavioral Health in Naperville. He said lawmakers are replacing one addictive substance with another. “People are prescribed opioids inappropriately all the time,” he said. “That doesn’t mean they should be smoking pot” instead. Weiner said some scientific research supports the use of marijuana to treat chronic pain, referring to a 2017 report from the National Academy of Sciences, Engineering and Medicine. But he said the industry, as it currently stands, puts patients at risk. That’s because patients who receive a medical cannabis card must use trial-and-error to find what works among a plethora of marijuana products. Weiner is concerned that cannabis dispensary staff aren’t trained adequately and he said they’ve been found to make recommendations that can harm patients. The Illinois Association for Behavioral Health, which represents more than 60 behavioral health organizations across the state, has taken a neutral stance on the bill. But the group’s chief operating officer, Eric Foster, said he supports efforts to reduce opioid prescriptions. The most recent guidelines from the Centers for Disease Control and Prevention find no evidence that opioids are effective for treating chronic pain. As many as one in four patients who take opioids long term struggle with addiction. Whether medical marijuana is an effective alternative to opioids for pain is still an open question, said Ziva Cooper, a cannabis researcher and associate professor of clinical neurobiology at Columbia University Medical Center in New York. “I think the public is unaware of how little data we have that’s rigorous… on the therapeutic effects of cannabis,” said Cooper, who is one of the authors of the 2017 NASEM report on medical marijuana. Earlier this year, Cooper published a study in the journal Nature that found medical cannabis can work in conjunction with low doses of opioids to provide greater pain relief than opioids alone. There are many anecdotal reports of patients using medical cannabis to reduce their reliance on opioids, but Cooper said more research is needed to know definitely whether that’s the case. While the changes to Illinois’ medical cannabis program could increase access to the drug, Sandy Champion, an advocate for medical marijuana who helped draft legislation for the pilot program in 2015, remains cautious. She said some patients with qualifying conditions can’t find a doctor who will complete the paperwork to apply to the program and she thinks that’s unlikely to change. “Opioids and heroin is killing scores of people. No one has died from overdose of cannabis,” said Harmon, who agrees more research on marijuana is needed. But he said the drug’s Schedule 1 classification, which means it’s considered highly addictive and has no medical use,presents challenges to scientists. Champion said she does not expect Gov. Bruce Rauner to sign the bill because his administration has been opposed to expanding the medical cannabis program in the past. But Harmon is optimistic the governor will sign it because of how closely he worked with state agencies throughout the legislative process. “I think we were very tuned in to their concerns and tried to make it a better program for them to administer,” Harmon said.